Interested in Becoming a Member or starting a PTA? Reflections Luncheon and Recognition Ceremony will be held on Sunday, April 14, 2019, at the Embassy Suites – Brookfield, WI at 11 am. Register today! Download the Reflections Registration Form or Fill it out Online. UPLOAD the Reflections Registration Form HERE. 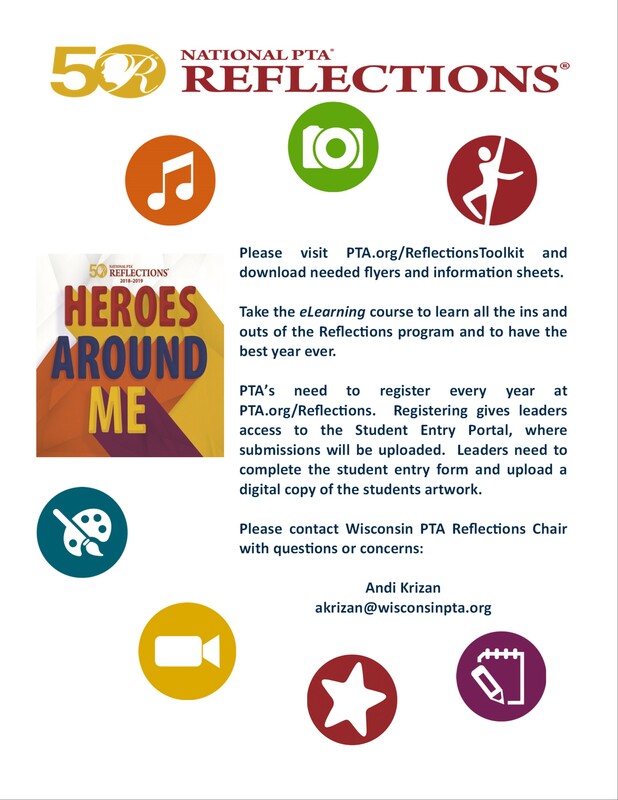 Place an ad to honor your Reflections winner in the 2019 WI PTA Convention Book. Black & White artwork 1/4 page = $25; 1/2 page = $30; Full page = $45 Place your ad here! 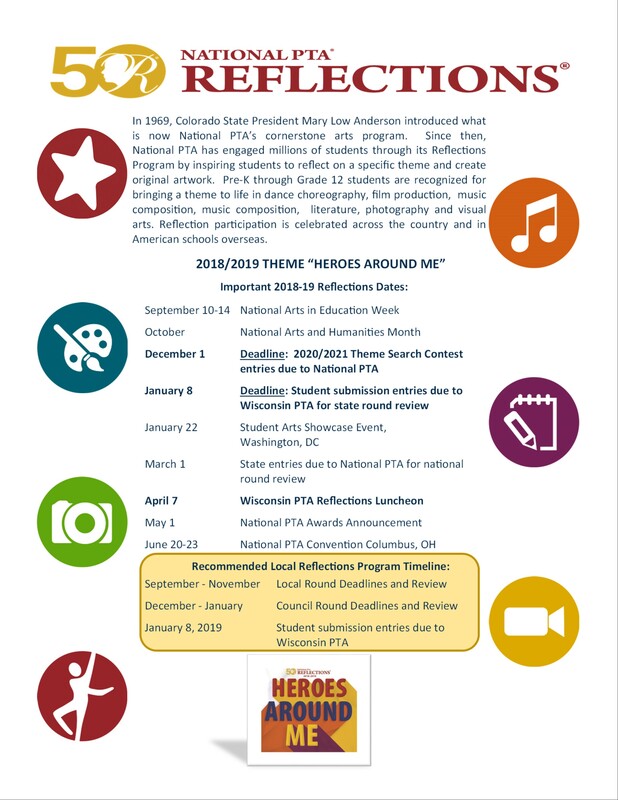 The 2018-2019 Reflections theme is “Heroes Around Me”. The National PTA Reflections Art Program encourages students to express their thoughts and feelings through creative arts. Every year a student produced theme is chosen, and children create artwork at home or school to express that theme. Prizes and recognition are offered on state, and national levels and sometimes locally. Students enrolled in a PTA sponsored school from preschool through 12th grade are able to submit art in the categories of visual arts, music composition, photography, literature, dance choreography, film production, and special artist. Participation is open to any student who attends a school that has a PTA in good standing – they are not required to be individual members. Congratulations to our Wisconsin National PTA 2018 Reflections Winners!! Dance Choreography Middle School division, Merit award winner Grace Johnson from NorthStar Middle School PTSA. Literature Middle School division, Merit award winner Reiyah Jacobs from Edison PTA. For the complete list of 2017-18′ National award winners click here.